I've been a very good girl this year. I've eaten all of my greens (except peas because I despise them) and I only eat chocolate occasionally every day several times a day. I've washed my makeup brushes regularly when I remember and have only bought 574 new lipsticks. I never fight with my brother (he moved out in April), I never swear and I promise it wasn't me that dropped something on the bathroom sink and chipped it (&#%!). I'm sending this to you rather than Santa because he's very busy and I'm not sure he'll have the time to stop off at his local Long Tall Sally store. It's Christmas, which means you should think about others first, so here are my gift ideas (although obviously I've based it on what I'd like to receive!). I don't know about your family, but in mine it's a tradition for my parents to buy me and my brother new nightwear for Christmas. I love wearing PJ's, but if you're tall you inevitably end up with them flapping round your ankles. I love Long Tall Sally's PJ bottoms because they're really long, in fact at 36" they're way too long for me, but I don't care as it just makes them more snuggly. The Robin print PJ bottoms (£28) would be a lovely gift for somebody to open on Christmas morning and the Stretch cotton cami in Bright red (£10) is a perfect match to go with them. I love a brand new fluffy dressing gown and the Super fluffy robe (£50) comes in a gorgeous teal colour and is also extra long to help keep those longer legs warm. Slippers are obviously a necessity in winter but for ultimate comfort and warmth you might as well go for some Checky slipper boots (£25). Obviously around Christmas time you want to be as snuggly while you're out and about during the day as when you get home at night, so a Fluffy snood (£16) is a good call for keeping your neck warm. Having quite long arms I often have problems with the sleeves on my coat not really being long enough and I can end up with a gap between my gloves and coat sleeves. So for anybody with longer arms the additional length on the Supersoft ruched knitted gloves (£12) would make them perfect. I love Christmas shopping and as it is Christmas it's perfectly acceptable to wear a Christmas jumper! The Robin sweater (£55) is not the most Christmasy jumper you'll find but there is some mistletoe on there for a hint of Christmas. I only wear typical blue coloured jeans (well I have one black pair I had to buy for a shoot) but I fancy a change and love the look of the Super stretch camden (£50) which come in a gorgeous dark teal colour. Christmas shopping in the cold requires some comfy boots and I think the Leather Chelsea ankle boots (£95) look perfect for this. Although it'll be cold, I don't tend to wear a coat when Christmas shopping as the shops are always warm and I overheat quite easily, so I'll just wear something like the Sequin snood (£18) that I can remove and carry easily. Christmas is the time when you can go all out on the glitter and sparkle, so for the Christmas party I've gone for the Shimmer tube dress (£50) and the matching Glitter courts (£55). I don't tend to go for quite tight dresses, as they usually emphasise my uneven hips/waist, but I really like the look of this one for Christmas. The long sleeves are good if you're concerned about being cold and I like the length as I'm not keen on anything above the knee if I'm not wearing tights. I know 2" isn't a very glamorous heel height, but I feel more comfortable when I'm not towering above most people! I'm one of those people that gets up on Christmas morning and gets dressed up. Back when I had a lot more disposable income I might even buy a new outfit especially for Christmas day. Although you know as soon as I've stuffed myself with Christmas dinner (AKA the best meal of the year) I'll be changing into those brand new PJ's for a late afternoon/evening of films and Christmas Eastenders! I'm a big fan of maxi skirts but obviously again I struggle with the length. The Metallic maxi skirt (£55) fits the Christmasy sparkle requirement and will actually be long enough for me for a change. With a sparkly skirt I think you need a simple top so I'd go for the Double layer camisole (£22) tucked into the skirt. To be honest, as I'm at home I would just wear slipper with my Christmas day outfit, but if I was going to wear shoes I'd go for a comfy pair of flats like the Deluxe leather ballerina's (£60). 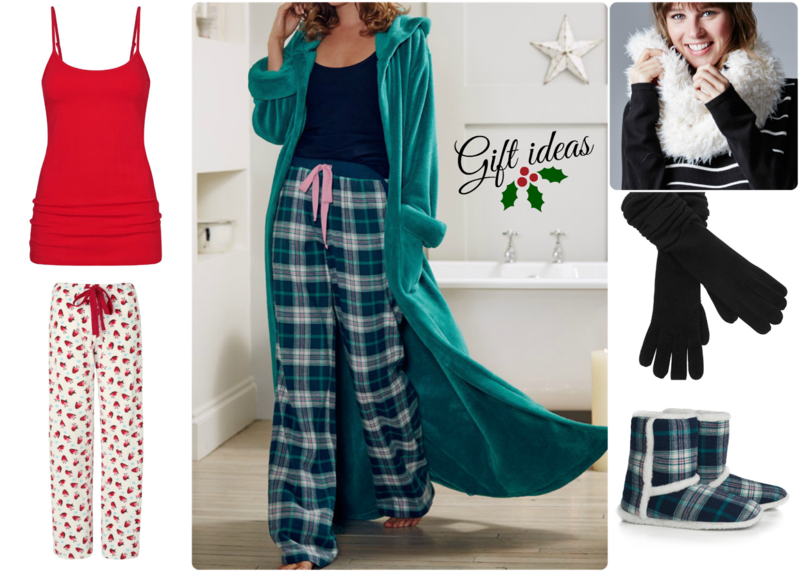 All of these items can be found on the Long Tall Sally website. *This is not a sponsored post but I was gifted an outfit from one of my wish lists. Lovely outfits, and I want ALL your gift ideas! Very funny! You're a moron!